Esta foto foi enviada para a pesquisa "Arte & Fusca" por Pedro Julio Hernandez, Presidente do Aguascalientes VW Club do México. Ele encontrou esta foto no Site VW Junkyard. Como a foto é muito curiosa decidi pesquisar a sua origem. Pelo "Alta Vista" encontrei o Site em questão, lá estava a foto com a indicação que ela foi enviada ao Site por Brad Bolton. Por sorte havia um link para o Brad e eu enviei um mail para ele. A resposta não tardou. A foto foi feita pela esposa de Brad, Dona, quando estavam fora, em Dryden, Nova York, EUA. A uma certa altura Dona gritou: Pare! Você tem que parar! Inicialmente Brad se assustou, mas logo viu o motivo da excitação. Fora da estrada, num bosque, próximo a algumas casas rurais, lá estava o Fusca de pedra. Ao que tudo indica o Fusca inteiro ainda está sob a camada de pedras. Brad permitiu o uso da foto. É sem dúvida uma foto muito curiosa. Agradeço ao Pedro po r ter enviado a fo to e a o Brad pelas explicações tão interessantes. Congratulations for the picture you sent to the VW Junkyard. As a matter of fact I received you picture from Pedro Julio Hernandez, President from the Aguascalientes VW Club from Mexico. It happens that I'm doing a survey on the use of the VW Beetle's image. This survey is called "The VW Beetle and the Popular Art". 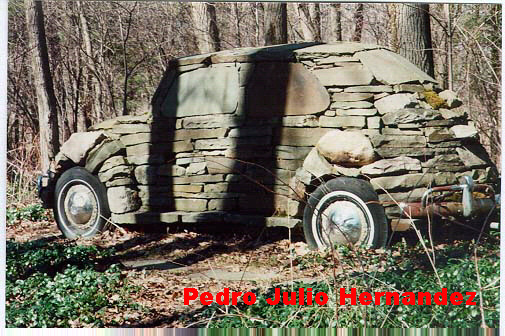 In this context I would like to ask you to kindly inform where you took the above mentioned above, I would appreciate also to get some more details if available, as who made the VW Beetle stone sculpture, when and why. Best regards for your attention. My wife took the picture outside of Dryden, New York, east of Ithaca, in 1995. I was there, too. I don't know who made the sculpture - we were just travelling through the area. Dona said "Stop! You have to stop!" Scared me at first, but then I saw what caused her excitement. It's just off the road in a wood beside a couple rural homes. It appears that the complete VW body is under the stone. Every few months, some publication or group wants to use that photo. Now I wish I'd talked to someone there. I always give permission to use the picture, so go ahead.